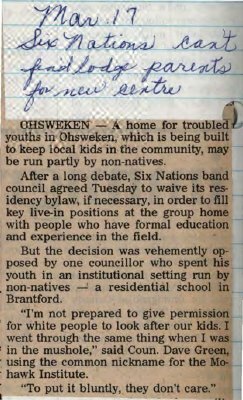 "Six Nations can't find lodge parents for new centre"
OHSWEKEN - A home for troubled youths in Ohsweken, which is being built to keep local kids in the community, may be run partly by non-natives. After a long debate, Six Nations band council agreed Tuesday to waive its residency by law if necessary, in order to fill key live-in positions at the group home with people who have formal education and experience in the field. But the decision was vehemently opposed by one councillor who spent his youth in an institutional setting run by non-natives a residential school in Brantford. "I'm not prepared to give permission for white people to look after our kids. I went through the same thing when I was in the mushole," said Coun. Dave Green using the common nickname for the Mohawk Institute. "To put it bluntly, they don't care."